The Sales Development Representative, Outbound (SDR) role prepares experienced sales candidates for an exciting and rewarding software sales career in a highly competitive and complex cloud ERP sale. This role will give you hands-on experience developing and building your sales skills while building your product knowledge and contributing to the company’s success. The skills acquired in the SDR role are critical for your success as you transition into a quota carrying role. The SDRs are tasked with researching, developing and qualifying revenue opportunities within their assigned territory. SDR's work closely with their Account Executives in order to target and qualify prospects. We promote successful SDRs into a variety of quota carrying sales roles. Some of our most successful sales people today started out as SDRs at Intacct. 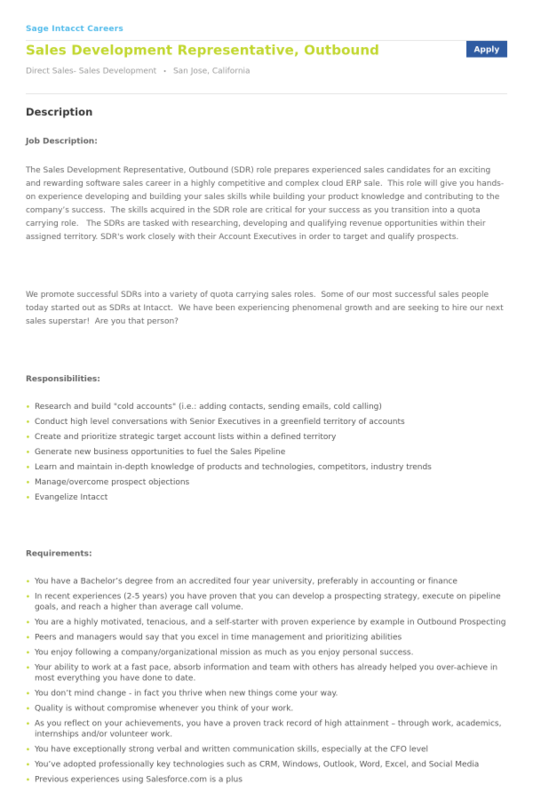 We have been experiencing phenomenal growth and are seeking to hire our next sales superstar! Are you that person? In recent experiences (2-5 years) you have proven that you can develop a prospecting strategy, execute on pipeline goals, and reach a higher than average call volume. You enjoy following a company/organizational mission as much as you enjoy personal success. Your ability to work at a fast pace, absorb information and team with others has already helped you over-achieve in most everything you have done to date. You don’t mind change - in fact you thrive when new things come your way. Quality is without compromise whenever you think of your work. As you reflect on your achievements, you have a proven track record of high attainment – through work, academics, internships and/or volunteer work.